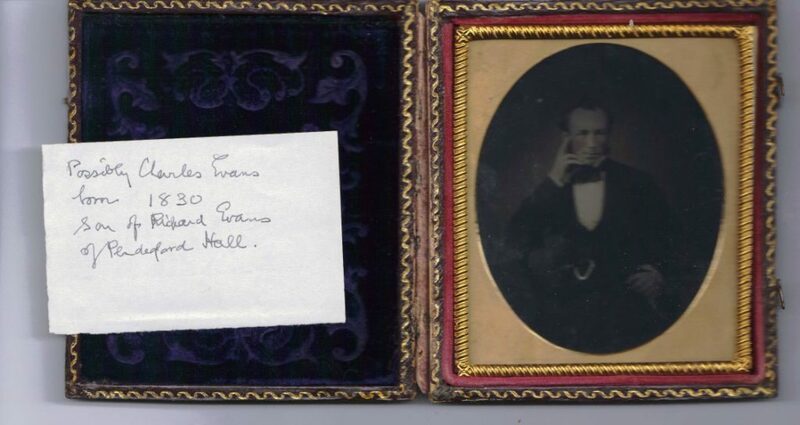 We have a collection of nine daguerreotypes of the Evans family – mostly of youngish men. 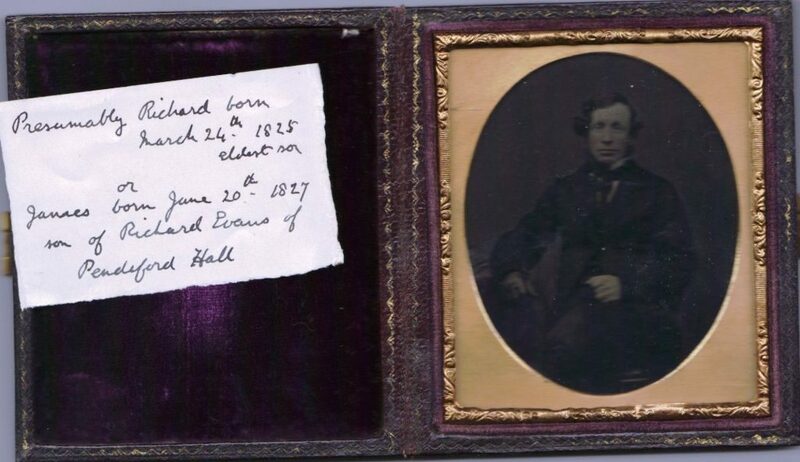 It has long been presumed that they are the sons of Richard Evans (b 1797) and Mary Evans (nee Shaw-Hellier). They were in the possession of Mary at her death in 1878 and passed to her children Sarah and Henry. However, there are major problems with identification and the precise identity of each is difficult to determine. The issues are as follows. Firstly the date of the technology would imply that they could not have been taken before the late 1840’s. 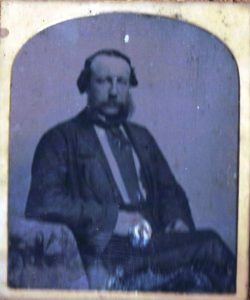 We know that there was a pioneering photographer called Oscar Rejlander, who was active in Wolverhampton from about 1850. The frames of the painted portraits of Richard Evans and Mary Shaw Hellier bear the address of ‘Darlington Street, Wolverhampton’ very close to Rejlander’s studio. The two portraits are probably a little earlier than the Daguerreotypes but their presence can assist in dating as well as motivation. 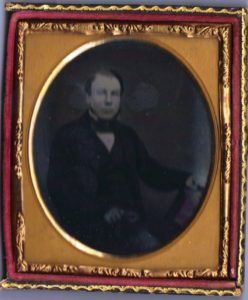 The daguerreotypes can thus be seen as a sequence of recording the family likenesses. Molly Evans recounts in a 1936 letter to Edith Ogden an attempt by Cousin Jean (nee Playfair Gow) to identify each of the brothers in the photos. The writing on the labels is presumed to be Jean’s and dates from 1936. There is little reason to believe that Jean knew anything particular that would give her insight as to who was who. Molly expresses her bemusement at Jean’s desire to label them. 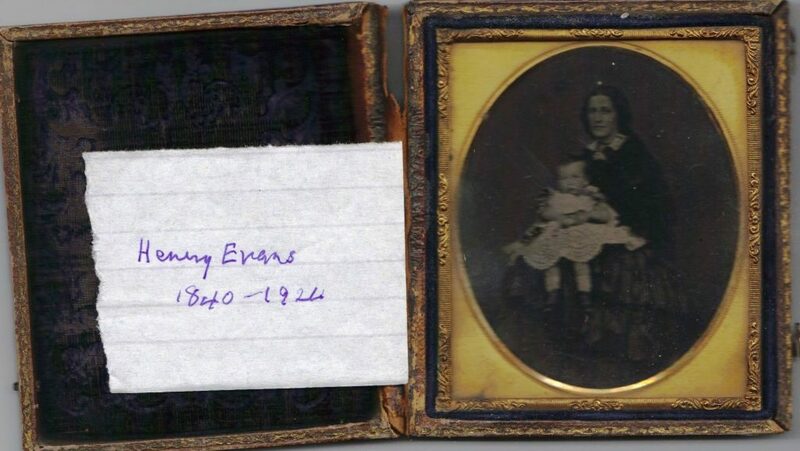 Molly’s father, Henry Evans, had of course been able to identify them but this was not written down. One photo of a mother and child is particularly enigmatic. This has in memory always been identified as the infant Henry himself. Henry was born in 1840 and the child would appear to be only two or three years old at the most. However, it was not technically possible to take photos of this ‘calotype’ much before 1845, above all outside London or Paris. Moreover, the other ‘young’ brothers look at least 25 and in some cases more like 40. This is all consistent with a much later date. If it is Henry, it is extremely unlikely that the others are his brothers. Not all the photographs have similar frames and they may not be taken at the same time. Overall, it would be fair to think that they all date from 1854 to 1860. By 1860 photographic technology had moved on. It should also be noted that Charles left for Australia about 1851 and hence would not be among the subjects. My best interpretation is that the older man is Richard Evans (b 1797) and the lady is his wife Mary Evans (nee Shaw-Hellier). The baby is more likely to be Ernest Evans with his mother Sarah Amelia (nee Agard). 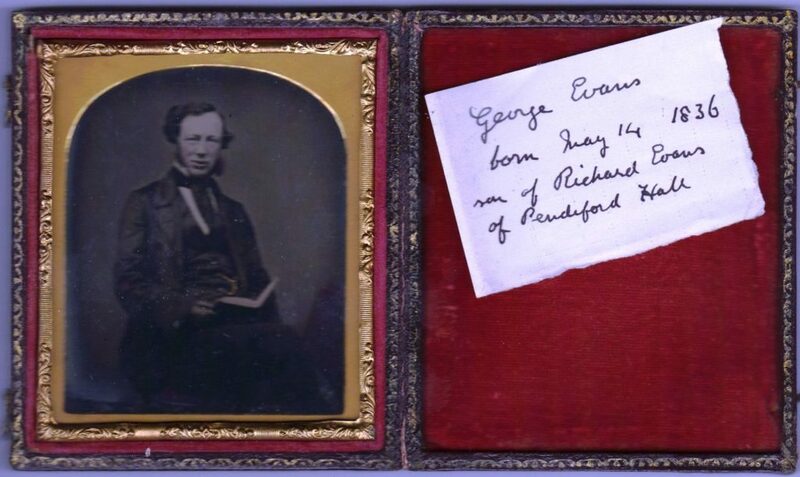 This would have been Richard Evans first grandchild born shortly before his death in 1859. The other brothers would at least have ages that could be consistent. It can really only be guesswork which one is which. It must have been an exciting new adventure to go from Pendeford Hall to Oscar Rejlander’s studio (or similar) and eventually come back with these likenesses. Seven of them are displayed on this page. Those of the parents, Richard and Mary Evans, are on their own ‘biography’ pages alongside to their respective portraits.